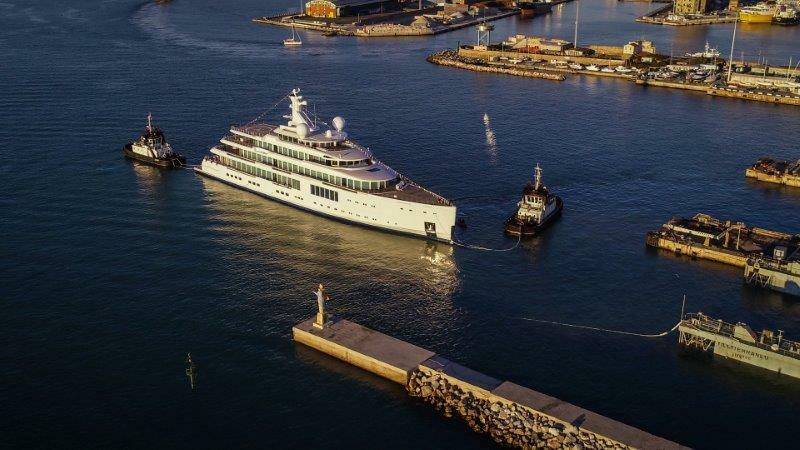 Yesterday, on February 5th, the eyes of the world turned once again to Livorno, where Italian shipyard Benetti successfully launched FB272, the second vessel to demonstrate its jaw-dropping new giga yacht building capabilities. FB272 is a steel yacht with aluminium superstructure built to comply with the PYC (Passenger Yacht Code) with a significant contribution of the owner to the conception and development of the specification, general arrangement and exterior design at the outset of the build. FB272 has been built to the unique taste of a very experienced owner in luxury yachts who has from the start of the project made available the Burgess Technical Services team, a full time, highly skilled and dedicated technical and project management team which has brought its significant experience and expertise in luxury yachts to the project. Less than two months since Benetti launched the giga yacht FB277, the Shipyard celebrates the successful launch of FB272, the second of three giga yachts to be revealed in a few months and a yacht with an entirely unique profile that was conceived by the owner. Prior to going to contract, the owner spent significant time in the development of the exterior design, initially with Hugo van Wieringen from Azure Naval Architects and then with the assistance of Reymond Langton Design and Zaniz Jakubowski of Zaniz Interiors. The exterior design was refined post contract with the assistance of Benetti’s in-house designer, Giorgio M. Cassetta, supporting Zaniz Interiors who took over responsibility for both the exterior and interior design of the yacht. FB272 is impressively high and massive to offer a new sense of proportion and demonstrates the huge scope of imagination and build capacity at the Italian shipyard. She features an advanced Lutron domotic system – approximately 500 kilometres of cable run across her hull and superstructure. Despite this hi-tech soul, she provides masses of connection with the outside world: the huge windows with 3 meters height offer an incredibly extensive glazing which floods the interior with light, thanks to an outstanding surface of 800 square meters of window glass. FB272’s exterior lines, which include six decks, were created by the owner, Reymond Langton Design and Zaniz Jakubowski and further developed by Benetti into a buildable 3D model. 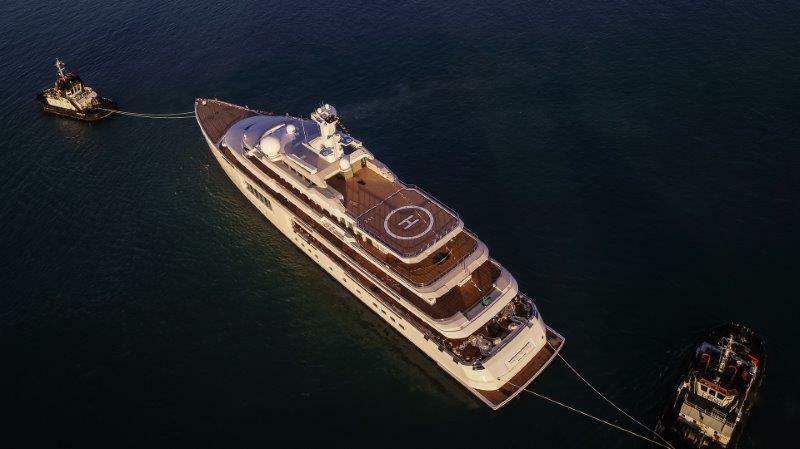 A straight bow offers brilliant seakeeping credentials, while a huge forward deck area brings guests a thrilling vantage point from which to cruise and relax. The main deck offers further dining and social spaces, sheltered and shaded by the graceful overhang of the beautifully styled superstructure. Above this is the wheelhouse and above again is a charming, private deck leading towards the helicopter pad – fully certificated by a recognized aviation agency – equipped with fuelling/de-fuelling station. High swathes of glass wrap the main decks, with the hull featuring a long horizontal strip of glazing from mid ship to stern. Windows on the upper decks are entirely uninterrupted by structure, giving each deck a floating appearance. Yesterday Azimut Benetti’s President Paolo Vitelli declared, “On this auspicious day, I could not be prouder to stand here among Benetti’s family, friends and colleagues to witness the launch of our latest enthralling creation. 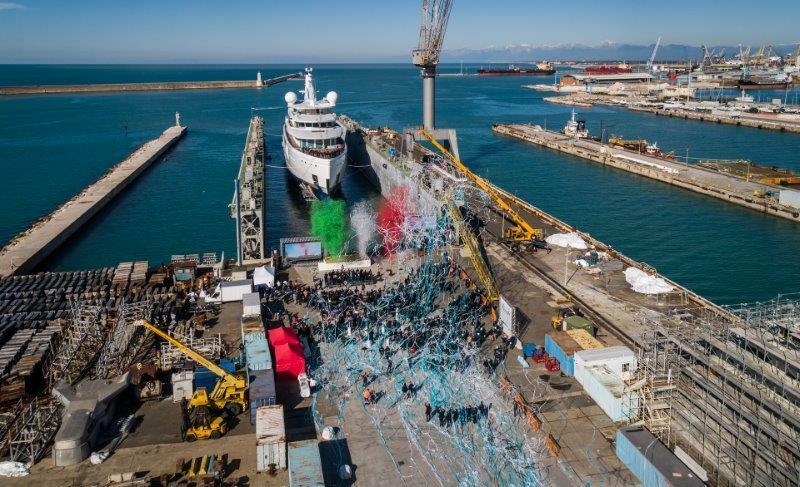 This iconic project has had a huge impact on local industry and, after more than 2 million hours of skilled work from over 100 suppliers, we can truly pronounce her as a wonderful achievement for Livorno and the “Made In Italy” ethos as a whole. The use of such a large number of suppliers is integral to the Benetti superyacht building philosophy: the perfect balance between the best “Made in Italy” craftsmanship with the most advanced technological and innovative solutions available on the international market.